Last Friday, the government released the worst jobs report in six years, and that has a lot of people really freaked out. What you are about to see is major confirmation that a new economic downturn has already begun. Last Friday, the government released the worst jobs report in six years, and that has a lot of people really freaked out. But when you really start digging into those numbers, you quickly find that things are even worse than most analysts are suggesting. In particular, the number of temporary jobs in the United States has started to decline significantly after peaking last December. 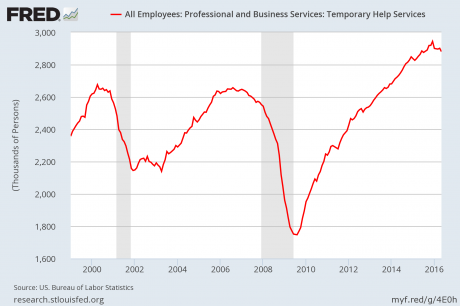 Why this is so important is because the number of temporary jobs started to decline precipitously right before the last two recessions as well.